The 2,200 seat Lawndale opened on October 19, 1927 with a screening of “A Girl from Rio.” Like several other theaters at the time, the Lawndale’s ceiling covered with twinkling “star” lights to resemble the night sky. 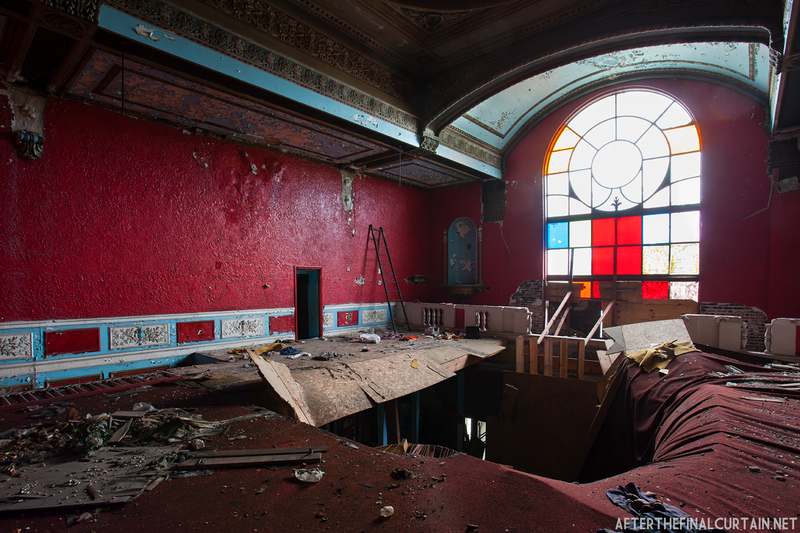 In most atmospheric theaters the ceiling is devoid of any detail work to help further the illusion that their patrons are sitting under the night sky, but this was not the case at the Lawndale. The dome in the center was the only portion of the theater to have the twinkling lights, so in that sense it was not a true atmospheric theater. In the mid 1930s the theater was purchased by a company controlled by Frank ” The Enforcer” Nitti, one of Al Capone‘s cohorts. During the 1940s, the Lawndale was used primarily as a movie theater, occasionally being rented out for various functions. 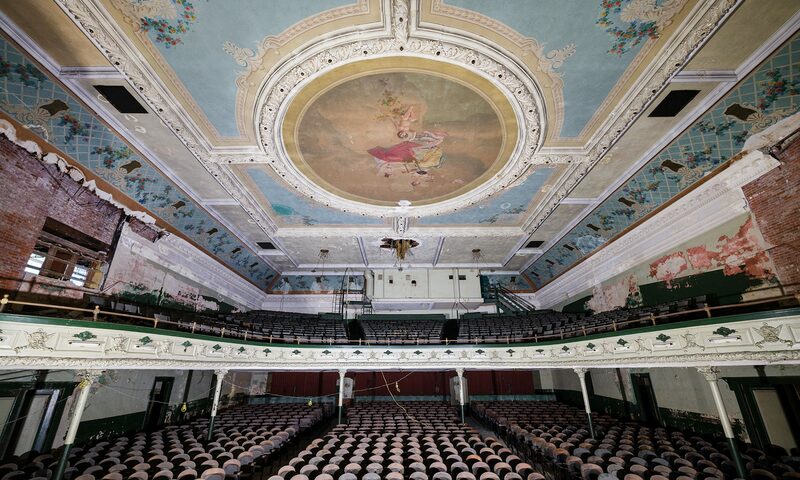 A drop ceiling was added when the theater was converted into a church. The theater changed hands several more times before it reopened as the Rena Theatre in 1949. During the week the Rena showed films; it had stage shows on the weekends. 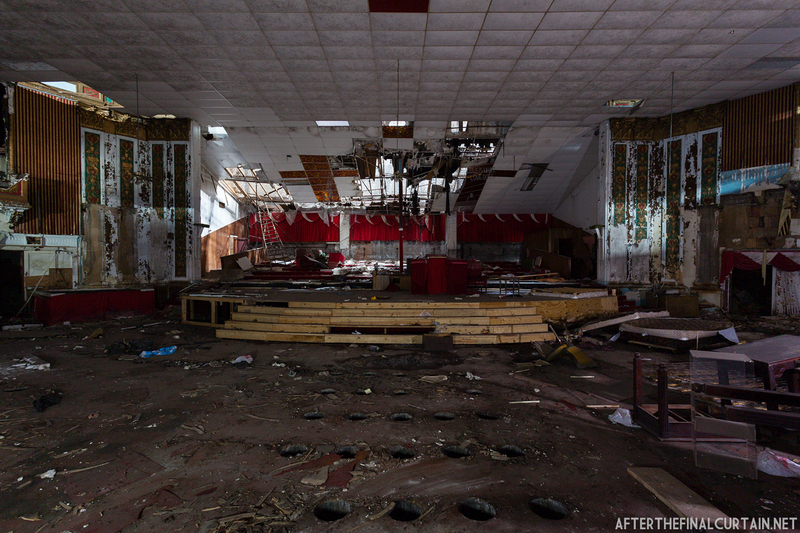 It closed permanently in 1961 after a gang leader was shot and killed in one of the main stairwells. The Lawndale was demolished in the summer of 2014. 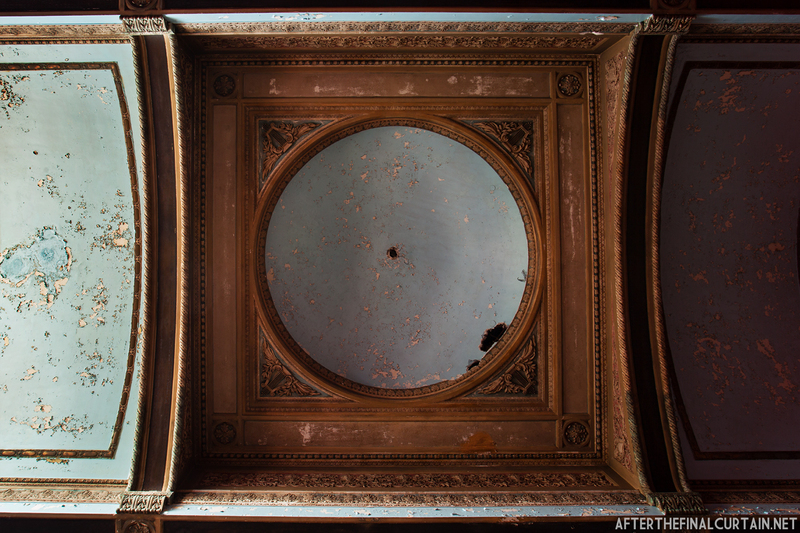 The ceiling of the lobby area. If you’d like to help with my exploring/research efforts, please consider purchasing a print, all support is very appreciated. Look at how much work went into closing off the balcony to make a main floor only auditorium area. It would have been nicer to use that money and effort to do as much restoration as possible. These places are very adaptable for many uses – there is always need for community centers, performing arts venues, and yes, even church spaces. In our current climate of “green,” adaptable use for existing buildings should be a priority over only building new with ‘stimulus’ money. Europe has always had this philosophy and it’s not unusual for there to be a 500 year old building still in use, sitting right next to new construction that is already falling down. Come on people, this hypocrisy of wanting to save and use renewable energy but having to always build ‘new’ to do it must be challenged. It makes me so sad to see all of these incredibly beautiful designs that are just left to disrepair and ruin, instead of repurposing. If we don’t have events to fill them, we need to FIND events to fill places like this, whether it’s high-school graduations, or student film festivals. We need to bring back our focus on the arts as something special and unique, something individual, not mass produced. 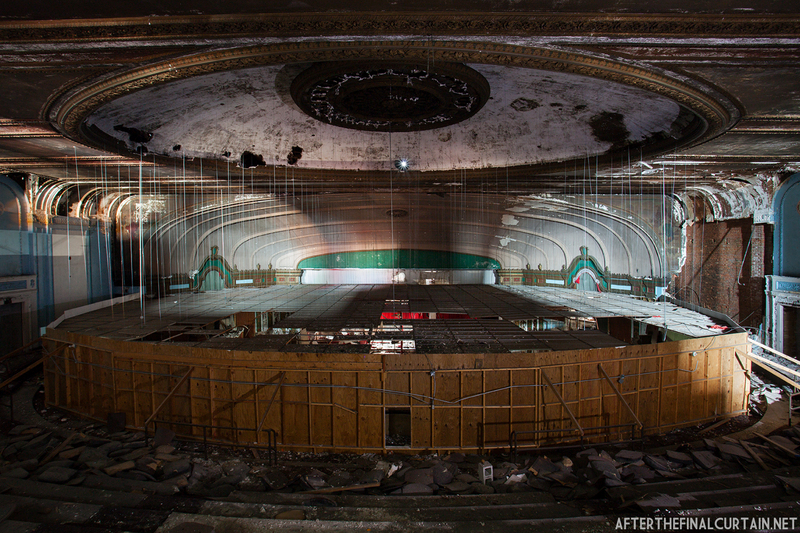 Personally, I would love to see a space like this turned into a low-cost, classic film venue. There are so many films I am just too young to have seen in the theatres, or some films from my teen years that I think are more enjoyable in the big screen. As you said, we don’t always have to focus on new, new new.. I’m sure there’s a decent size market that would love to, for example, take their kids to see Mary Poppins in the big screen for $20 in a venue like this, versus spending $60 to take the whole family to a new release. Is this closed to the public? If so, how would we go about getting permission to shoot a video here? any information at all about this would be greatly appreciated. Thank you. Yes, the building is closed to the public. You’d have to contact the owners, but I don’t know if they are letting anyone inside the building. I WENT TO LAWNDALE THEATER Mny tomes when i was growing up in the neighborhood. shame to let these treasures fall down. 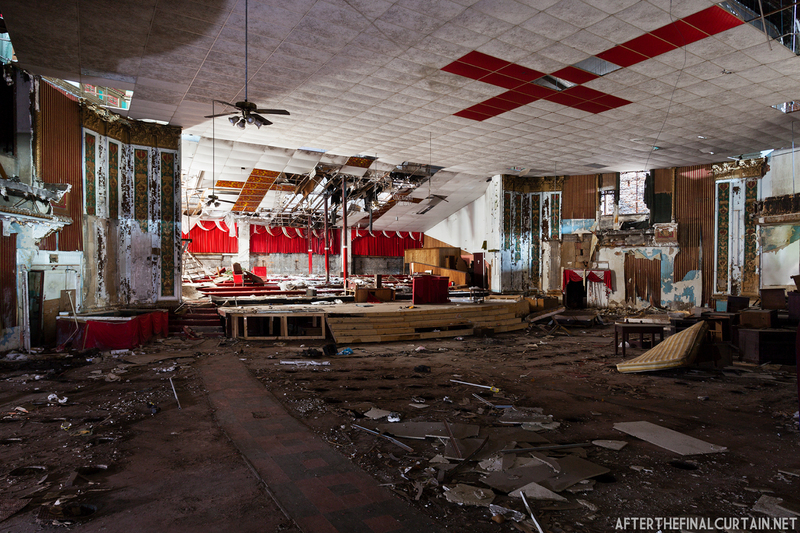 I used to go to shows here when it was a theater, and I attended a few church services here as well. It’s sad to see it this way. I remember this theater as always being the Rena. It was the 1st movie theater I visited. I would walk there from home and stand in long lines to get in. We could smell the popcorn as people went in and out the entrance. There was something heavenly about going there. We were allowed to go on Sundays after church.. No church..no movie. There are so many memories there. It seemed short lived . I saw movies like Hercules, Babes in Toy land, Our Man Flint, Dracula, Elvis Presley I think the last movie was one of the James Bond 007.. Gold Finger. I was not sure why we stopped going. We lived between both theaters the Rena and the Central Park Theater. maybe 1 mile apart both are on Roosevelt Rd. The Rena was bought by a church ..Mercy Seat Missionary Baptist Church Rev Amos Waller Pastor. My grandmother was a dedicated member of the church and my grandfather and grandmother had their funeral services there. Although I was raised Catholic,I could still smell the popcorn as I walked in on an occasional service. During Thanksgiving and Christmas there would be events there and turkeys were given away to who ever wanted one. As of July 30,2014… I noticed it was being demolished. So sad to loose a neighborhood Land Mark. I took a video of the demo. its was at night so it’s not very clear. The Central Park is still standing it to is a church.. House of Prayer. I’m not sure what the plans are for that location. I moved out of the area in 1976 but I occasionally drive threw to see how thing have changed. Pingback: 30 Abandoned Places That Look Truly Beautiful | "Love and Play EVERY day!" - LifeMusicFun ! I wonder why the alderman from this ward is letting this place fall to ruin? It has storefronts on street level and apts above. Could revitalize that whole corner!!! 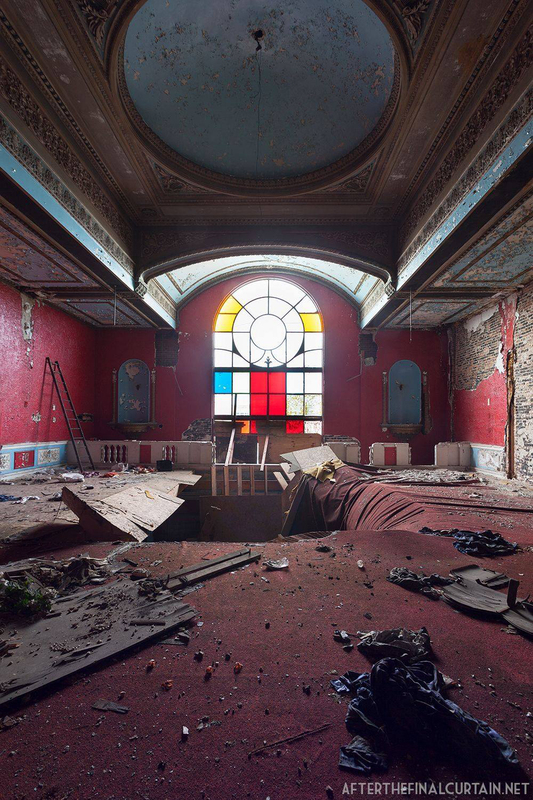 Pingback: 30 Abandoned Places that Look Truly Beautiful | Earth. We are one.